Students get a trigonometry lesson in Hawaiian anthropic hand measurements - a technique used by ancient Hawaiians. A growing trend in math education uses culture as the lens for comprehending mathematical concepts. As a young school girl growing up in Hauʻula, Linda Furuto struggled with math. She felt a disconnect between what she learned in class and what she experienced outside it. Until she discovered ethnomathematics. Ethnomathematics, simply put, is applied math taught through a cultural lens. Furuto is a math professor at UH Mānoa and has been a pioneer of ethnomathematics in Hawaiʻi for nearly 20 years. 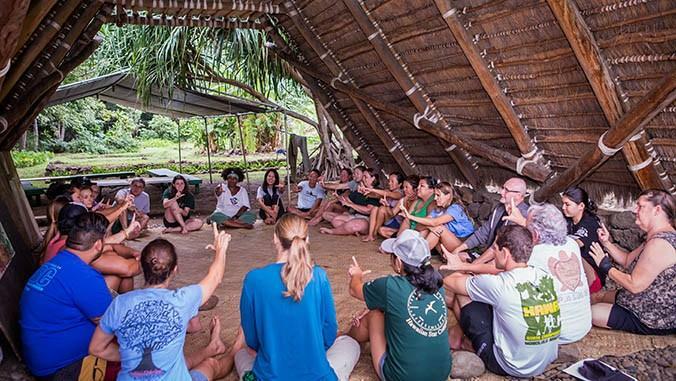 “Ethnomathematics is basically real-world problem solving that empowers students to be locally-minded, global citizens filled with a sense of purpose and a sense of place, and we do this inside and outside of the classroom,” says Furuto. Popular courses include exploring the sine curve by studying waves, learning Cartesian coordinates by weaving a leaf known as lauhala, and observing the Fibonacci sequence during a forest hike. There are lesson plans for nearly all mathematical concepts at all levels from elementary through college. And they're all designed for students living here in Hawaiʻi. Janel Marr teaches math to seventh and eight graders at Kailua Intermediate School. Over the past decade, Furuto has been working to introduce as many Hawaiʻi school teachers to ethnomathematics as she can. Ethnomathematics was also the pillar for building the math program at UH West O’ahu, where she taught for six years. During that time, she experienced increased enrollment in math courses of more than 1,400 percent. “The overall passing rate in mathematics courses almost doubled the average passing rate for the University of Hawaiʻi system,” says Furuto. Now Furuto is spearheading a graduate certificate program in ethnomathematics at UH Mānoa. Math is the skill of the future but engaging Hawaiʻi’s students has always been the greatest challenge. Furuto thinks ethnomathematics may help.